Hello Readers, Today we will discuss the latest education updated news of World University Rankings 2018. The above thought is true in terms of education as we all accept the hardest things but that things are always right. We cannot defend it by saying that in terms of education. 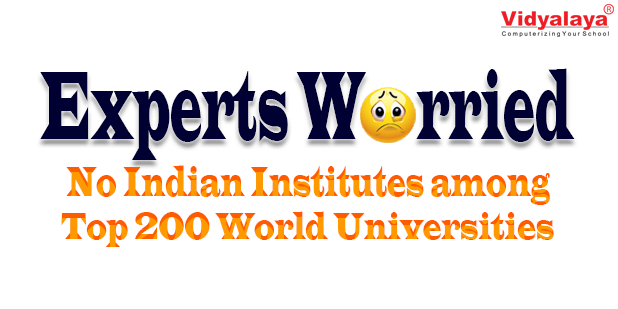 Indian education institutes are not in top 200 universities.Experts have voiced concern over not a single Indian educational institution figuring in the top 200 list of the Times Higher Education World University Rankings 2016-17, released on Wednesday. Though we fall into high population criteria the education results we get is not at all acceptable & justifying our country’s ranking. In terms of education, we speak more but no less. Going through the last year statistics IISc-Indian Institute of Science & some IITs-Indian Institute of Technology wherein the ranking of 200-500. While IISc has dropped from the 201-250 band in the previous rankings to the 251-300 band, IIT-Delhi and IIT-Kanpur have fallen from the 401-500 band to the 501-600 band. IIT-Madras fell from the 401-500 band to the 601-800 following. The drop comes at a time when the IITs have sought more funds under the human resources development ministry’s Vishwajeet project aimed at helping them climb in global academic rankings. India has 19 institutes in the top 800, two more than last year, and 12 others between 801 and 980. Though we may pat ourselves on the back because a record 31 Indian educational institutions – including 14 new names – have made it to the list, the picture does not look as rosy when we take the total area and population of India into consideration. Comparison to India, China, and Singapore’s educational status is far better. The way we are encouraging wrong things is just a phase of going into a direction where the black shadow is only been there. Corruption in our country is becoming a trend nowadays for any sort of work we do. People are angry and they should be why not? When India can make decisions of demonetization for country’s betterment why not focus on education part as well. Gujarat is a state where the best Educational Institutes are being located. The ranking is depressing seriously…! Gujarat is the state of more literate people than other states, & the ranking is falling nationally. Also, just a thought “if we are to improve, we should change our attitude towards education & stop politicising it. We need to concentrate on specialized research to improve our ranking. World’s Top CEOs are Indians- like Microsoft, Pepsico, Google, etc. but the work they do is completely outsourcing due to lack of resources in India. Top Educational Institutions as Nalanda, Takshashila, Vallabhi, and much more are having the capabilities of enhancing the growth in a good direction. But our success youngsters want a single platform where they can show their ability and skills. there is no meaning of growth & the success of Right people does not get right platform. Indian institutes have that small platform related to R&D so if we want our rankings internationally we need to grow our resources and funds in this sector. However, the human resource development (HRD) ministry seemed more optimistic about Indian educational institutions making a mark in upcoming lists. “We have been making plans to ensure that our educational institutions perform better. “Quality is a major challenge, especially in research, which plays a major role in global rankings. We need to invest more in research and other allied activities to improve our ranking,” he said on the condition of anonymity. When India can take Decisions of demonetizing & people are accepting it, why not take decisions related to education. Work speak more than Words I guess…!